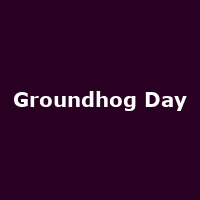 "Groundhog Day is the story of Phil Connors (Andy Karl), a cynical Pittsburgh TV weatherman who is sent to cover the annual Groundhog Day event in the isolated small town of Punxsutawney, Pennsylvania, when he finds himself caught in a time loop, forced to repeat the same day again and again...and again. As each day plays out exactly the same as before Phil becomes increasingly despondent, but is there a lesson to be learnt through his experiences, will he ever unlock the secret and break the cycle?" The 2016 Old Vic run is directed by Matthew Warchus, featuring music from composer and lyricist Tim Minchin, choreographer Peter Darling and designer Rob Howell - four of the creators of the international sensation Matilda The Musical."